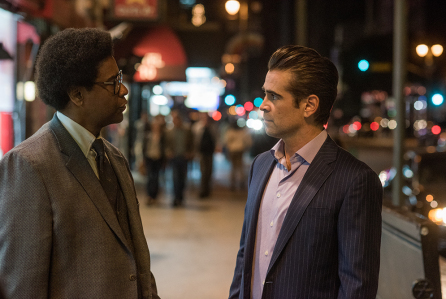 Denzel Washington headlines Roman J. Israel, Esq., which expands nationwide over the Thanksgiving weekend. From Nightcrawler director Tony Gilroy, the legal drama hopes to appeal to the star’s fans and adult moviegoers looking for alternatives over the Turkey Day frame. Colin Farrell and Carmen Ejogo costar. Israel has some issues that could block it from achieving solid grosses. While Washington can be a draw, this isn’t an action pic which are often his highest earners. Additionally, there is little awards buzz and reviews have been mixed (it sits at 55% currently on Rotten Tomatoes). I’ll estimate that this won’t even reach double digits over the full five-day holiday weekend. The Toronto Film Festival is underway and that means a fresh round of Oscar Watch posts hitting the blog after Venice and Telluride provided their own. Last night, David Gordon Green’s Stronger screened. It tells the true story of Jeff Bauman, who lost his legs during the Boston Marathon bombing with Jake Gyllenhaal playing him. Early reviews have been positive yet it probably won’t factor into the Picture or Director races. Gyllenhaal is a different story. His performance has been praised and it would not be surprising if he landed his first nod for Best Actor (he did get a Supporting Actor nomination for 2005’s Brokeback Mountain). Additionally, the Actor race seems somewhat light at press time and the voters could make up for other nominations Gyllenhaal could have received (Nightcrawler anyone?). Costar Tatiana Maslany could also find herself in discussion for a Supporting Actress nod over her costar Miranda Richardson. Bottom line: Toronto has bolstered the chances for Gyllenhaal to be among the five finalists for Best Actor.